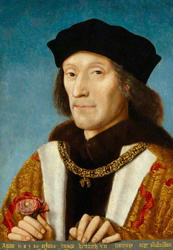 Henry Tudor (1457 – 1509) was born in Pembroke Castle. He later became the first monarch of the Tudor dynasty, ruling as Henry VII from 1485 until his death. Henry was born in troubled times; the Yorkist and Lancastrian branches of the ruling Plantagenet family were fighting the Wars of the Roses (1455 – 1487) to determine which would continue the English monarchy. Henry’s family was staunchly Lancastrian. His father, Edmund, died 3 months before he was born and his mother, Margaret, was just 13 years old at the time of his birth. It was Margaret, a descendant of Edward III, who gave Henry his claim to the throne, however loose it might have been. Recognising that his claim to the throne might place her son in danger, Margaret sought sanctuary with her brother-in-law Jasper Tudor, 1st Earl of Pembroke, after her husband’s death. Thus, Henry came to be born in Pembroke Castle. Later in life Henry would defeat Richard III at the Battle of Bosworth Field (1485) and claim the throne.